Apparently, the Secret Avengers got off A.I.M. Island based on the bodies that surround Scientist Supreme Andrew Forson and the reports of the escape of a submarine which can be piloted by one person. And Mockingbird is not happy that Forson attempted to kill her, since they are allies and all (I know we need a scorecard). After Mockingbird completes her business with Forson, we have a brief interlude with one of the A.I.M. Ministers as he contemplates the fate of his late dear friend Taskmaster. After our team comes home, some members resign their commission with S.H.I.E.L.D..
To quote the last issue's review, “No Agent Coulson! I am just saying, we are Coulson free. I think he should be helping out Director Hill in her talks with M.O.D.O.K., but hey I'm just a AC fan kids! Maybe he is just off camera trying to get Deadpool his dirty dirty Monies!” Does one really need to add to this? Oh, I know. I am pretty sure Nick Fury Jr. did not even rate one line! This is the conclusion of “To MA.I.M. A Mockingbird.” I have to be honest, this is more like an epilogue. Really most of the action has already occurred between issues. And so the story really concludes fast, too fast. We do not get to see our heroes escaping we get to see the aftermath. Sure, Mockingbird has her moments against Forson, but the majority of this tale is about the impact of a battle we do not get to see end. And honestly, there is some trippy stuff especially around the deceased Taskmaster. And the whole Hill negotiating with M.O.D.O.K. piece which one feels should be significant, especially in light of A.I.M. folding so easily, is placed to late. I have read this entire run. I will admit it took me time to get into the storytelling of Nick Spencer. But I did come to enjoy it. But this ending arc had a lot to desire and I wonder what the division of labor was between Spencer and Ales Kot who will not write the title alone. Honestly, there are so many questions that have been left open starting with issue #1 that have never been addressed! For example, why did Hawkeye and Black Widow join the team? What has Fury Sr.'s protege Daisy Johnson been up to? Where is Agent Coulson? And these are just a few. In the end, I am not fully satisfied that Spencer has told the full story that he wished to tell. 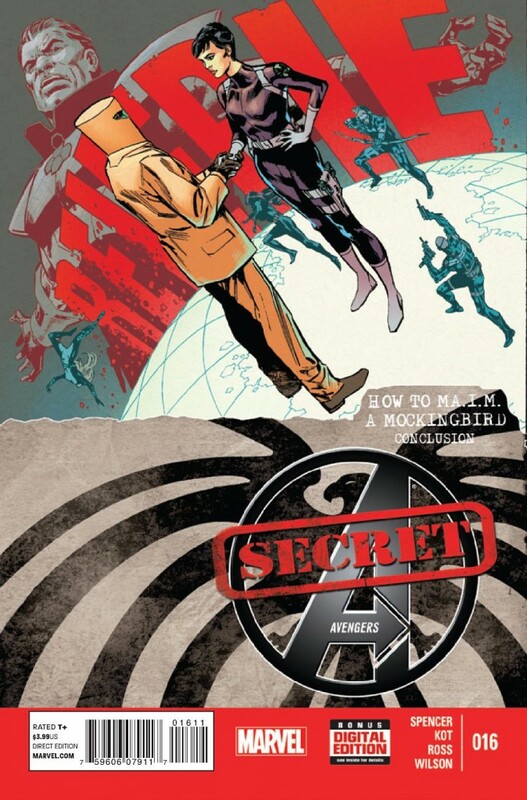 At the end of this story, some members of the team are no longer Secret Avengers. Of course, with issue #1 of All-New Marvel NOW! we will get a new team. Oh, too bad I know that one former member will be right back on the team with the new #1. I guess big S.H.I.E.L.D. really cannot be trusted! And there is at least one development revealed in the final pages that I question if we will see play out in Secret Avengers. Maybe Marvel could start a title name The A-Team to capture the future developments that this issue promises at that may have nothing to do with S.H.I.E.L.D.. Since I really want to say something good, I really liked Luke Ross' art especially with the Forson scenes. I hate to say it, but this title did not go out as strongly as I would it too before it was closed (to be restarted again). I have been one of the most outspoken fans of this title. But I think they should have spent effort completing Spencer's very complex story, instead of prepping readers for the future creative team and I assume new story. Will I be there next month, yes. But I will say it will take a lot more Coulson and Fury Jr. to get me back to selling this title to others. Of course, adding Agent May would not hurt my opinion!